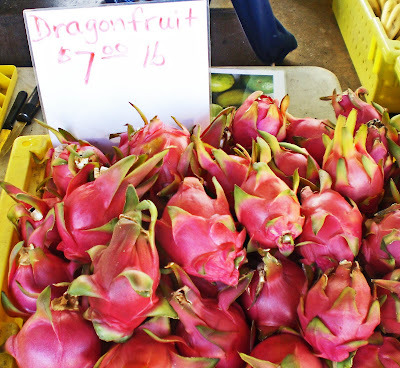 A trip to Alemany Farmers market was an adventure in the unknown fruit department. 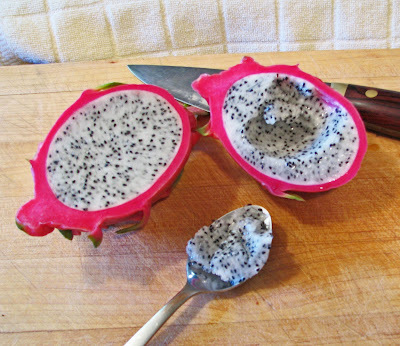 We found the Dragon fruit. This fruit from a cactus is very colorful and pretty. It sometimes is called a strawberry pear.We asked the vendor a couple of questions. She suggested we chill the fruit to improve the taste. One was purchased and and placed it in our politicaly correct cloth vegetable container. Once we got home the fruit was placed in the Chilebrown Ice Cave. A short while later it was sliced open. It had an interesting speckled interior. The texture was like a stiff pudding. It did not have a lof of flavor. I would compare it to a kiwi but not as sweet. There just was not a lot to it. Our curiosity was satisfied. I am going to fry up some bacon. Interesting - and beautiful photos! Thanks Zoomie, We are heading up North for a couple of days to experience new Meat Adventures. Will report back. I think I would like to try one, even though I know from your description it's a little blah. Wow.